This is as yet an unnamed work in progress, which I've slowly added to in spurts since around September. Apologies for anything that seems disjointed, incomplete, or misplaced - this post is kind of on the fly. First off, the language is influenced by Irish Gaelic, Chinese, Japanese, Spanish, and English mostly. Or totally. I haven't quite figured it out yet. g/ğ h/ħ - the latter sounds something like when you've been underwater too long and take a really loud gasp of air when you finally come up. I don't know how many of you have done that though. EDIT: so I totally forgot to put why they can be written as diphthongs - in the case of [o:] [u:] and [a:], they may cause lenition of the preceding consonant. In the case of [i:] and [E:] there may not be lenition. Whether or not a consonant is lenited depends on the word root and if it was lenited in the older forms of the language. Accent placement may be shown by the diacritic when non-differentiating (e.g. oí vs. oi): so, /iou/ has no accent, /ióu/ is accented, and /ioú/ precedes an accented syllable. The accents don't need to be marked, but can be for decoration or in more formal writing. /è/ - like in Chinese - I think it might be [M\@]? /si/ is kind of like Chinese 的, having a part in verb nominalization, marking the possessive (with genitive case), and being used with color words. Verbs: There are two verbs for "to be" (though, they actually mean "exist") much like Spanish ser/estar, and the latter verb is marked with a stative morpheme, /aíth/, which occurs before any other affix on the verb. This morpheme occurs with the continuous aspect marker as well. There are /ar/ and /or/ type verbs. Past participle: /ar/ verbs generally take /-dèl/, feeling verbs often take /-cueh/, and many verbs take /-nuen/. /or/ verbs may take /-nuen/, but some take /-gov/. Note that the near and far aspect markers refer respectively to 2nd singular and plural, or "you." The mean literally "this he/she/it" and "that he/she/it." The /ar/ or /or/ endings on the verbs mark the infinitive form. Verbs in a series take liquid or nasal prefixes which may or may not become lenited depending on the vowel content of the surrounding verbs. Verbs beginning with apical consonants take /n/, which assimilates to /m/ with bilabials, and becomes somewhat devoiced with voiceless obstruents. /l/ goes with vowel-inital verbs and becomes a sometimes heavily-trilled and syllabic /r/ when before /h/ or /ţ/. Verbs dealing with emotions/states of mind (such as love/hate/fear/feel etc.) may undergo some root vowel raising which does not cause lenition. For example, /blanar/ [blanar] "to love" --> /blaín-/ [blein]. Politeness may be indicated through verb-noun compounds. For example, "to meet" may be simply the verb /gnávor/, which can mean "see" or "meet," or it can be made polite by adding "face" - gnávor cfuie (see/meet face-ACC). Compounds should not be split. or "I will meet you" /gnávdéihióag dtáh/ (see-FUT-1s.-OBJ ACC-you) <-- this is less polite. One important serialization is that of showing the direction of an action, especially one which is beneficial to the speaker. Direction is shown through the verbs "come" and "go" which, when used to describe beneficial action or change in a situation (like the weather), are exempt from the affixation of the serial verb morpheme. Use of these verbs can differentiate between the speaker being present at an event or absent. For example, "he came to my house (and I was there)" would be said /NOM-3s. arrive-come-PAST-3s. to OBL-house GEN-1s./, and "he came to my house (but I wasn't home)" would be said /NOM-3s. arrive-go-PAST-3s. OBL-house GEN-1s./. They gave me that: give-come-3pl.-PAST-OBJ ACC-that to OBL-1s. They gave him that: give-go-3pl.-PAST-ABST-OBJ ACC-that to OBL-3s. I'll give you that: give-go-1s.-FUT-OBJ ACC-that to OBL-3s.n.a. Note how in the second sentence the verb took an abstract marker to show that the recipient was not the speaker or the listener, but an entirely separate party. The marker is t/d for /ar/ verbs and ol/oh for /or/ verbs, showing singular/plural. It could instead be marked with the general abstract morpheme /-m/ also. This marks distance from the speaker: so, /co/ is just "that" and /com/ is "that(faraway)". /-m/ also attaches to abstract ideas such as unicorns, infinity, and inexperience. In such cases, it can attach to nouns, adjectives, or verbs, always as the final morpheme. On verbs it also can be used in a final position to turn the word into an attributive adjective. It also may indicate general or hypothetical situations, with the meaning of "suppose that..." or "what if..." and as such can be used with the hypothetical/conditional marker /-uv/. But, /-uv/ is more specific, strong, or intense than /-m/ by itself. e.g. Suppose I go? (jokingly) - ganám, ganuvám? Suppose I go? (intending to regardless of your opinion) - ganuvá? The verbal abstract morphemes nè/nèh on /or/ verbs is found on nouns as well, as diminutives like English "-ling" or borrowed "-ette," and on names (like James --> Jimmy). This is a very generic term, literally meaning "thing" but used in all sorts of situations. It can be the noun "that (near)" or the adjective "this," and with the /-m/ morpheme it becomes "that (far)" or a word as diverse as Japanese 事 or 物, both meaning "thing" but covering both the tangible and intangible. /co/ when used after the infinitive form of a verb carries a different semantic meaning than /si/, sort of like conversion in English: "His drawing (action) was so elegant" and "his drawing (finished product) went on display" - the latter would be expressed here with /co/, and the former with /si/. There are a number of words which function solely as mood-setters or emotional intensifiers and which may precede a phrase or sentence, affix to a particular segment within a phrase or sentence to give it oomph, or complete a phrase or sentence to bring the feeling to a close. Phrase-initial particles are the only words in the language which use the ingressive consonants, and these usually impart a sense of negativity. For example, /gou/ indicates disappointment or general cheerlessness, a bleak outlook, whether because of something that was just said or because of what the speaker is about to say. It may be used in such instances as "gou, I really wanted to see that movie today, too bad it's blizzarding outside" or on a more serious note, "gou, I'm so sorry to hear about your grandfather!" /héi/ is an expression of shock or dismay or even terror, should the opportunity arise for that particular emotion. It could be used, again with a movie example, upon seeing the first commercial for the next Twilight movie (sorry if any of you are fans) or when recounting the tale of when you were mauled by a shark. The pronunciation of this word is usually very sharp and sudden, effectively startling the listener and setting the mood. /ğáid/ suggests pleasure of various sorts, from happiness to pride to the feeling one might get from pulling a prank to nostalgia to hysterics to physical pleasure. The ingressive sort of counters the general rule, since this is a positive word, but this particular one is very common and can even be used by itself (as can /gou/ and /héi/) as a simple expression appropriate for various situations. I use it sometimes when I'm eating particularly delicious chocolate, or when I get called off of work when I don't want to go anyway. /suv/ is a word, meaning "fence", but in an expressive context it indicates being in a hurry or feeling anticipation, and when drawn out (suuuuuuuuuv) or phrase-finally it gives off a feeling of uncertainty or confusion, and can go with /noa/ (see below). Conversely, /buáin/ suggests that a mood, emotion, or opinion may only recently have been felt, or is too tenuous to back up with /gè/ /diu/ or /èna/. /gè/ /diu/ - with a falling intonation these indicate strong personal opinion about something or they state facts, and with a rising tone they mean the same but with less emphasis. Men often omit it in favor of grammatical structures to say the same thing. /noa/ /nèa/ - this expresses doubt or reluctance. /ah/ /ouh/ - a question particle; it can be used for thinking aloud or to actually ask a question which requires a response, and can be used with /vi/. It also can call into question a specific segment of a phrase or sentence by immediately preceding it. /iáma/ /ióud/ - this is an exclamatory marker to show extreme negative emotion (with a negative sentence) or surprise, disbelief, awe, or anything which in English may call for a raised voice or excited tone. As for numbers, a decimal system was borrowed from the khinet ddamychal speakers in order to standardize the counting system (which originally only went up to 13). For now, phonological shifts are holding me up so numbers are still under construction. They're based on terms for natural things like animals and plants to which those particular colors are inherent, and which are considered the source of the colors. In the case of clothes, the color suggests the material - if you wear a certain shade of brown that looks like deerskin, it will be assumed that you are wearing deerskin. Blue (light) - biblouc luia [mImlOUk lui@] - biblouc is a type of small, 5-petaled flower that grows in sprays, with a white or orange center and red stamens and pistils. It grows close to the ground in the shade. Compare that with "egg door" - garce fióuh; an egg-shaped door found at religious institutions which closes off a shrine or holy icon. Men on the whole tend to speak more politely than women in order to project a more educated and considerate visage. Likely this rose from their matriarchical society, which no longer is, but the linguistic effect remains. Females use fewer polite expressions in order to establish intimacy and show off know-how versus book-how, as men (by choice) pursue higher education at a greater rate than women. Using "I think" or "it could be that" is polite for both sexes, but men use it more regularly than women. (bav-uv-ea h-tù ta-tiua) - exist-HYP-3s.PRES GEN-3pl. OBL-friend "he probably exists as their friend"
Here the second (female) version is more blunt, personal, expressive, and personal, while the male's is tentative and more distant, but still expressive. Men will use hypothetical /-uv/ for ideas like "must" (it must be...) and "shall" as well as in suggestions or indirect questions to be less demanding. Men also use fewer particles and sometimes avoid 2nd person pronouns, speaking passively instead. Some men will speak entirely in 3rd person. Temporal nouns - if syntactically necessary these words may take additional, possibly redundant morphemes. Day after tomorrow - ramráţ; partially reduplicated "day" + /m/ + "day"
There are lexical items for telling time with the borrowed khinet system, but at the moment there are no numbers to complement them. Time phrases occur in a linear sequence: 2:30 would be 2-hours 30-minutes/1-half-hour. 2:30 = "2 hours of the teller (clock) 30 minutes/1 half hour"
There is a more traditional approach to time, which fluctuates with the seasons, and which is divided into periods of light and dark. Depending on the season and the global location, these times vary enough to render them utterly useless as a standard, but they are still used in personal notes, storytelling, song, literature, and in combination with hours and minutes for clarity. Having begun this combination method it's become easier to figure out exactly when the traditional time words refer to, and may end up putting them out of widespread use in favor of standard and regular time. Men tend to use the traditional time words more than women, who may use them when speaking with men or just colloquially but who usually stick to the hour system. This is what I've got for now... It's more than I thought it would be. (^_^) Thanks for reading! Questions, comments, and constructive criticism are welcome and appreciated. So, I think this language actually might be a descendant of ddamychal, albeit a distant relation and one greatly affected by other languages derived from ddamychal in its earliest stages. The language branched from ddamychal from which this language might be derived is called Nó Mah [no: ma:h], and while Nó Mah is pretty much a dead language now (in its original form that is) this new language is something of a revival of it with a multitude of outside influence in its vocabulary and even basic grammar. So, with that said, I've got numbers. I've their current forms in this language (which I suppose could be called Nomah...), as well as the words from which they were borrowed. 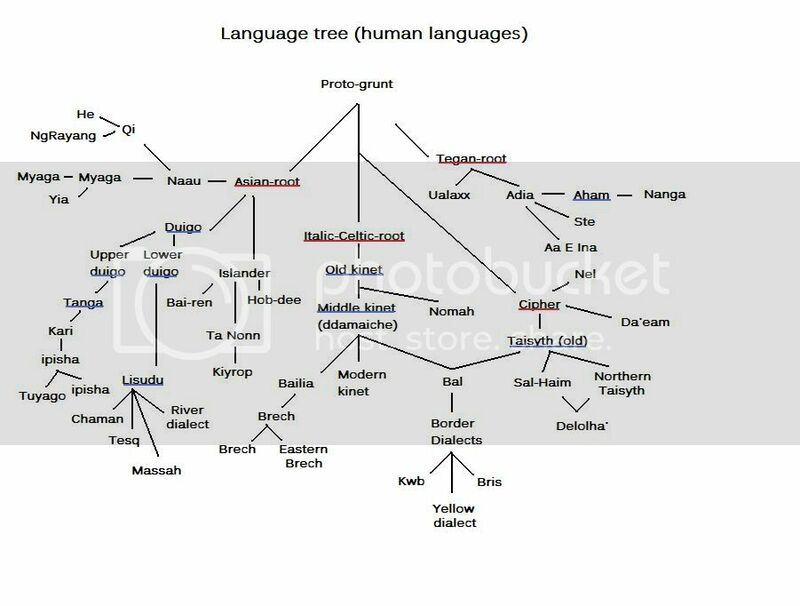 Note that /ddamaiche/ is an older form of ddamychal, and is preceded by /kinet/, and Brech and Báiliá are members of a branch from the Italic-Celtic base in this language tree. Well, thanks for the thought.